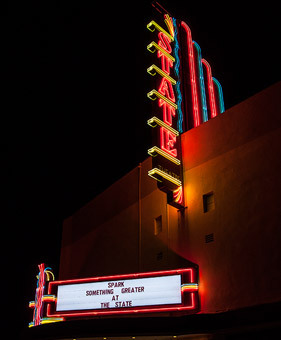 The State Theatre For The Arts (STFTA) non-profit organization is extremely proud to announce that on March 11, 2011 escrow was opened for the purchase of the State Theatre, located in the center of historic downtown Red Bluff. Congratulations are in order to the hard working members of past and current STFTA Boards of Directors, the State Theatre Steering Committee, and numerous other community volunteers and stakeholders who have made this moment possible. Calendar year 2010 was filled with Due Diligence and Strategic Planning activities and in December 2010 the decision was made that purchasing this grand old building was within our capability. Negotiations with owners Ben Sale and Dr. Ron Clark took place over the first several weeks of 2011 and an agreement was reached in early March setting the acquisition price at the value established by a recently commissioned commercial appraisal plus 50% of the cost of numerous building improvements undertaken by private ownership after the completion of the appraisal process. Mr. Sale and Dr. Clark should be recognized for their willingness to absorb in excess of $50,000 as a partial cost of said improvements. The State Theatre For The Arts has begun a long-planned Capital Campaign under the direction of committee members, Dr. Marvin Locke (retired Superintendent of Tehama County Schools), J.B. Stacy (Senior Vice President, Cornerstone Community Bank), Venita Philbrick (STFTA Immediate Past President) and Bill Cornelius (current STFTA President and retired Tehama County Chief Probation Officer). Current efforts are centered on contacting scores of community members, businesses and other stakeholders who have in the past provided, or have expressed an interest in providing, substantial financial support for the acquisition and/or restoration and operation of the theatre going forward. We are heartened by already having received in excess of $50,000 from a very supportive community prior to the opening of escrow. Through the generosity of current ownership, and in cooperation with STFTA, events are currently being offered at the State Theatre on a sporadic basis as a community service. As a part of our Capital Campaign it is anticipated that it will be only be a matter of weeks before STFTA sponsors our “State Theatre Campaign Kickoff Gala Event” to be held at the State Theatre. Very soon each and every one of us will have the opportunity not only to celebrate the State Theatre’s proud past, but more importantly we will have the opportunity to invest in its exciting future! And oh, by the way…SEE YOU AT THE STATE!